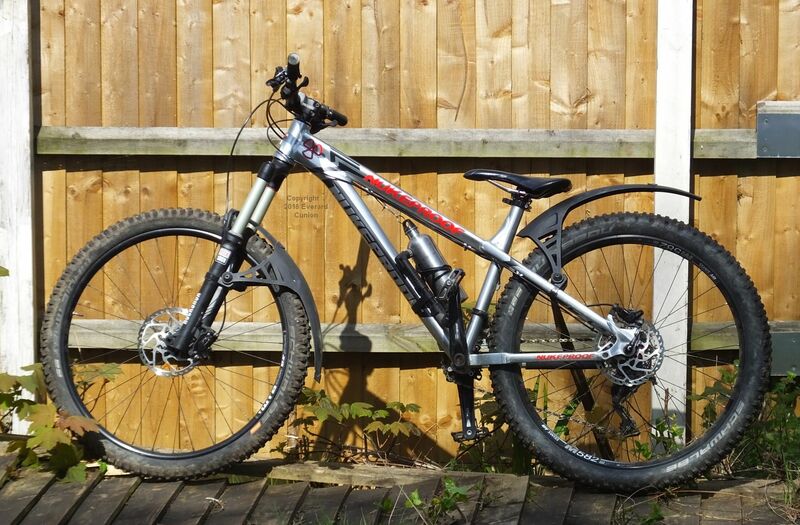 MTB used to stand for Motor Torpedo Boat, but now it stands for MounTain Bike, apparently! 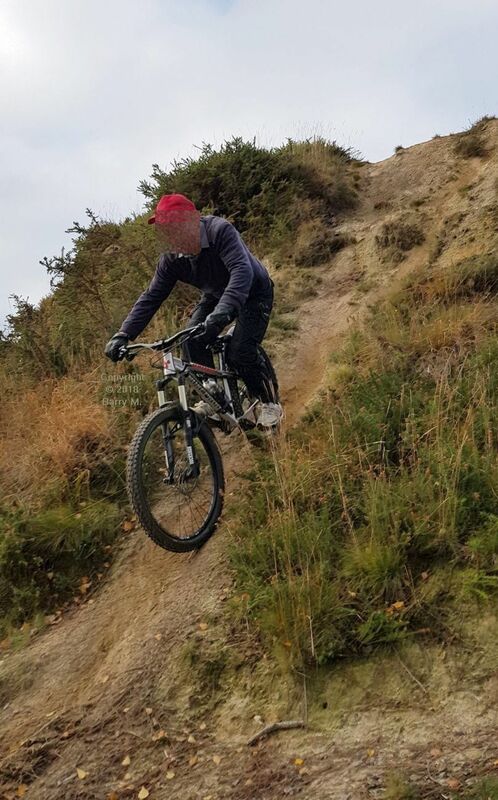 Note that my interpretation of trials riding is that of 1970s ‘no stop’ motorcycle trials rather than the hopping balancing act of today’s cycle trials where the front wheel rarely touches the ground. 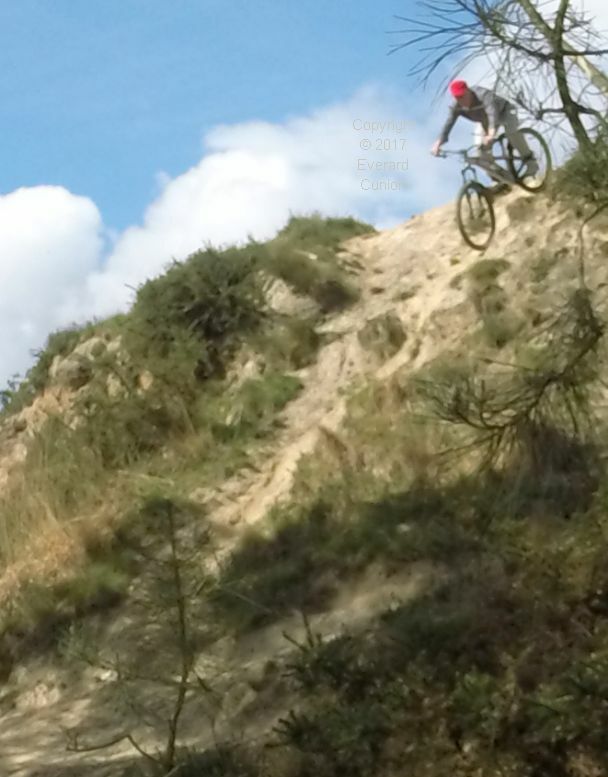 Dry and dusty conditions in mid-April, 2017, made some sections more tricky than earlier in the year at this Dorset (England) biking area. Paradoxically, when the ground is damp — but not actually wet — you get more grip. 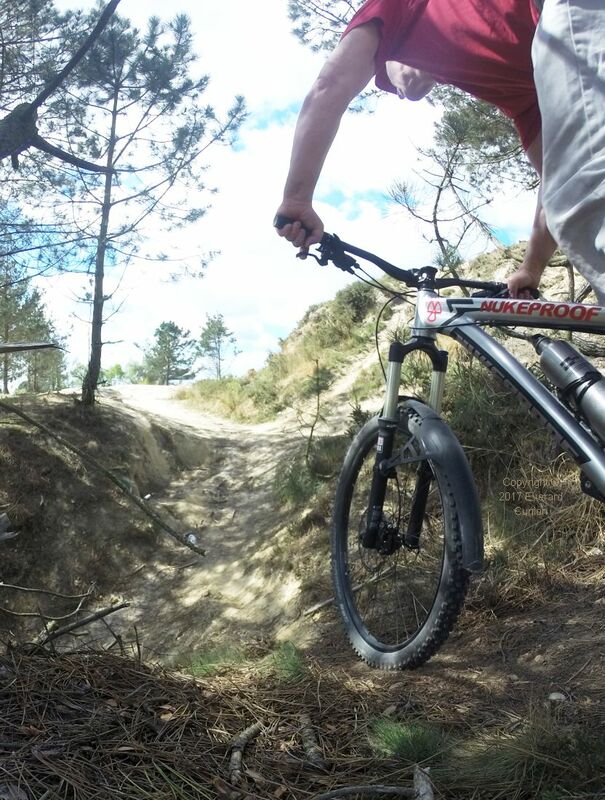 Grip affects your ability to climb without the rear wheel spinning and the bike losing forward speed, without which you cannot maintain balance, so you either put a foot down (losing a mark if in a trials competition) or you come off entirely. The Nukeproof Scout Race is the 2015 model, but I bought it new in 2017. (Later versions have less ground clearance.) Incidentally, I added the red decals (transfers) and, because they were a dull shade of red, I over-painted them with acrylic gloss red. I also painted the previously bare aluminium badge on the front and I bought myself a new red cap to match. I find that when I wear a red baseball cap, instead of the dog walkers telling me I should not be there, they apologise for getting in my way. (In my experience, only red has that effect.) Go figure. Grip also affects steering. 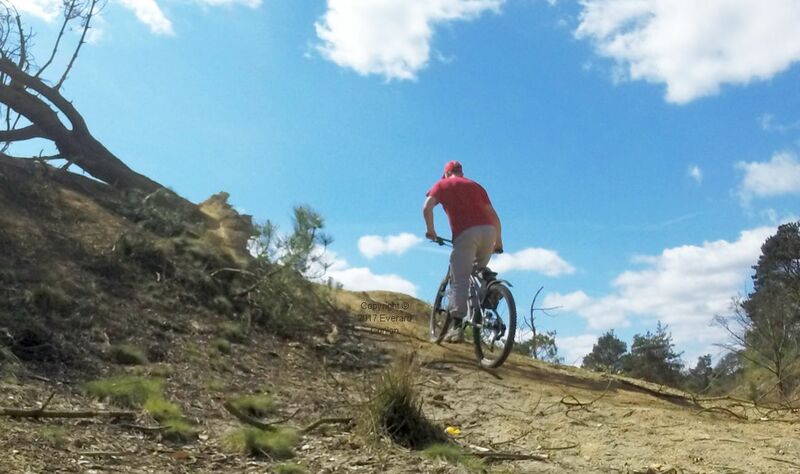 When it is dry and dusty, as it usually is when I ride in the sandstone and clay here in Dorset, in turns and on a camber (a transverse slope) the wheels drift; to the outside of the turn and downhill, respectively. 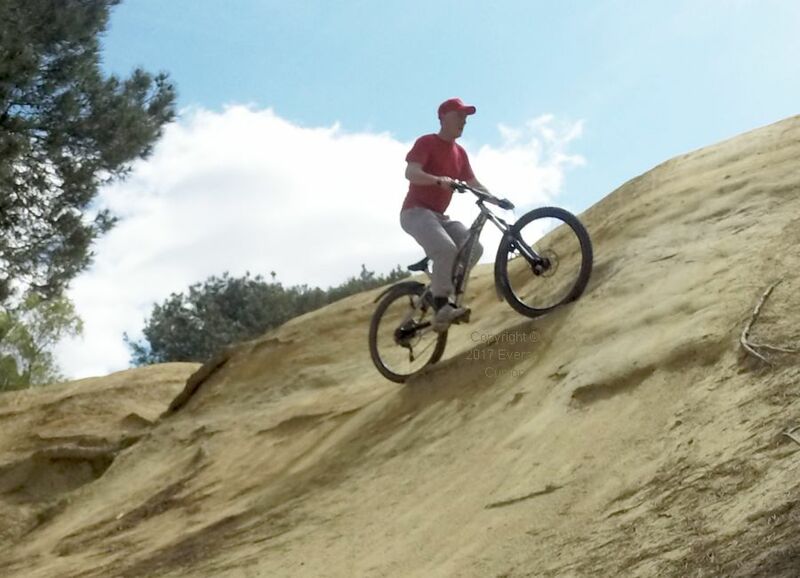 However, you automatically and subconsciously compensate by over-steering and, when riding along a slope (rather than up it or down it) the front wheel is a few inches higher up the slope than the rear wheel. That climbing attitude is matched by constant downhill sliding, so you cross the slope horizontally (or at whatever angle you are trying for). 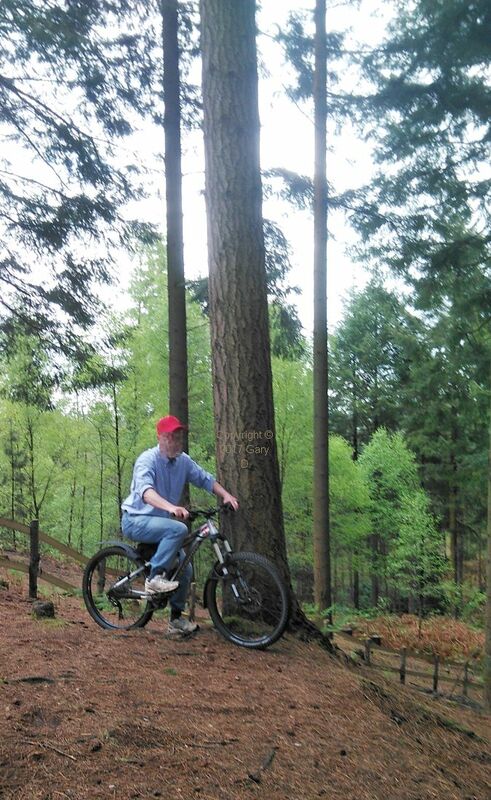 On the Nukeproof Scout, second gear climbs in grippy conditions become third gear climbs in slippery dust. These photos demonstrate the need for low gears. 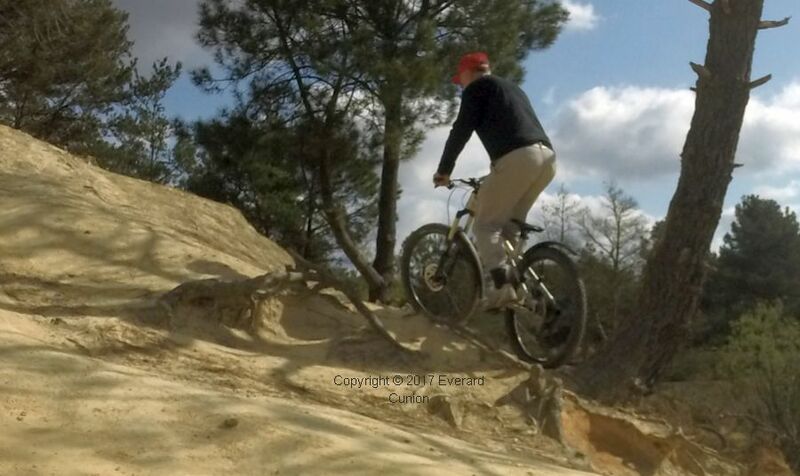 This is a second gear climb on the Nukeproof Scout and a first gear climb on my older and geared-down Charge Blender. It has a clay sub-surface and, when it is very wet, even the Scout wheel-spins to a halt. The steering of the Scout is so light that, in late April 2017, I swapped its 60mm reach stem (the handlebar centre is 60 mm forward of the steering tube center line) with the Blender’s Husselfelt 40mm reach stem. The Scout handles better as a result. However, occasional clanking from somewhere in the drive chain became unbearably frequent and it turned out to be a broken ring deep inside the rear hub (two months from new). The Scout was out of action for two months while the shop endeavored to find a replacement part (which the manufacturer stopped using some time ago) during which period I reverted to riding the Charge Blender. That forced move provided an opportunity to compare the handling of the two bikes again, this time going from new to old. 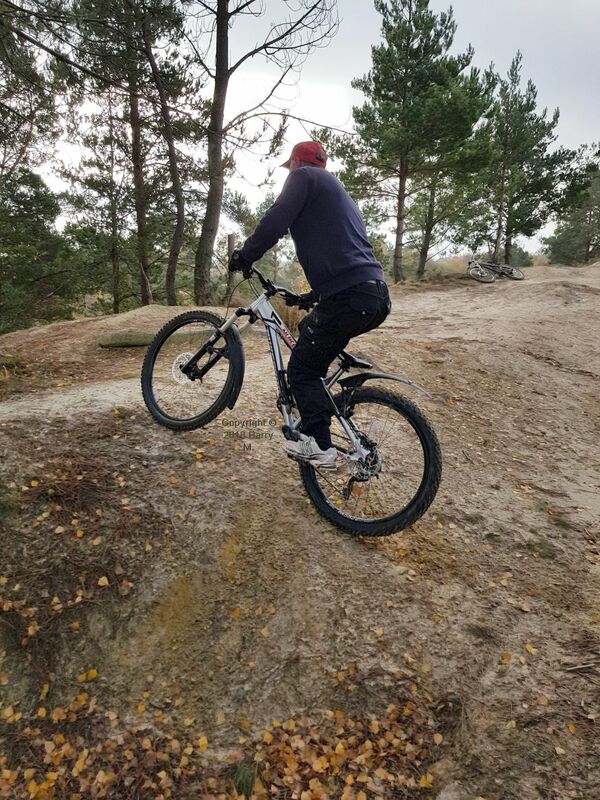 It is not strictly a fair comparison because the Blender is much too highly geared for this kind of riding. (I did not realize the magnitude of the problem until now.) In contrast, the gearing of the Scout is exactly right. Gearing aside, the Blender immediately struck me as short, springy, and wobbly. Because of its shortness, fore and aft weight shift is critical: On one ride I went over the handlebar twice! Its springy wobbliness stems (according to experts) from its old-style wheel hubs and the frame being steel rather than aluminum. The 1982 High Country has a long steel frame with no suspension, but it has good ground clearance. 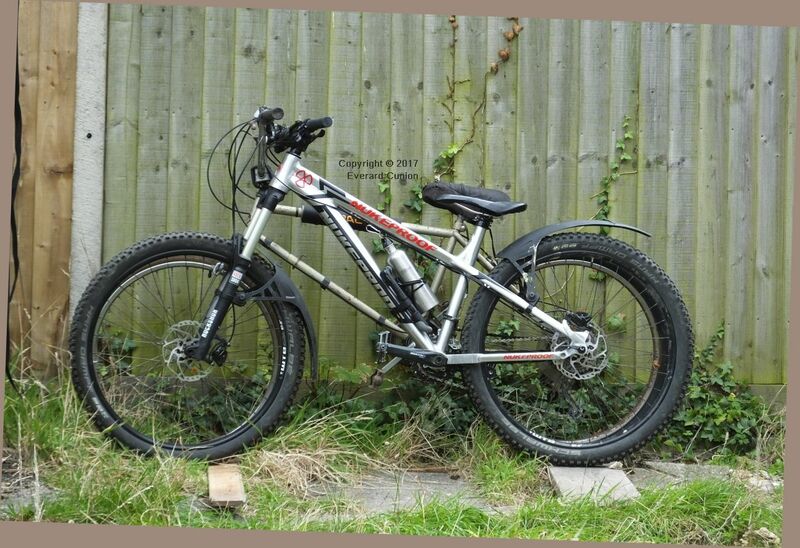 The 2008 Charge Blender also has a steel frame, but it is shorter and has front suspension. The 2015 Nukeproof Scout is as long as the High Country, but it has an aluminium alloy frame, front suspension, and larger 27.5 inch wheels. The one area where the Blender scores over the Scout is in its greater ground clearance. 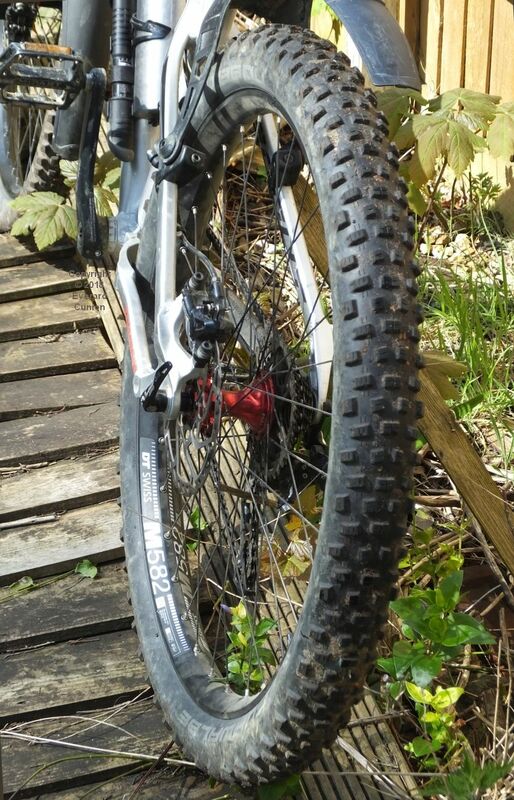 The distance from the ground to the hub is actually the same as that on the Scout, but its shorter wheelbase and shorter and stiffer suspension equates to greater ability to surmount rock steps and tree stumps with less likelihood of striking the chain-wheel or a pedal on the obstacle. I had my local bike shop remove the outer chain-ring, which has increased its ground clearance by a full inch. I use the higher gears only when transiting between sections, so speed is not important to me. I then replaced the original Schwalbe 2.35 inch Hans Dampf Evo tyres. They are perfectly good, but I feel that a thicker tyre on the back and a thinner one on the front makes more sense, particularly on a ‘hard tail’ bike such as this. After all, off-road motorcycles are made that way for a reason. I put a Schwalbe Nobby Nic 2.8 inch on the back and a Schwalbe Magic Mary 2.35 inch ‘Super Gravity’ on the front (it is thinner than the Hans Dampfs, but it has bigger knobs). The photo shows the placement of my water bottle, which just fits in the frame, and, beside it, a mini tyre pump. Inevitably, the replacement hub failed. 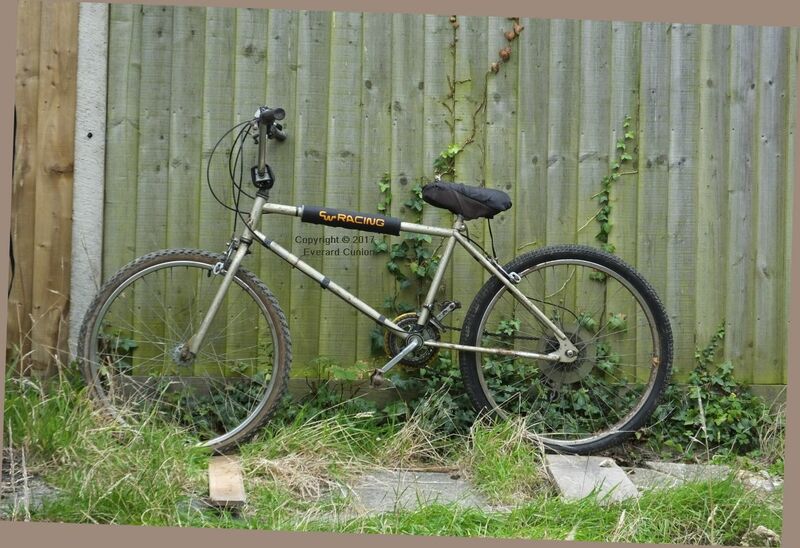 Although still under warranty, rather than wipe out the shop’s profit from this bike, I had a local shop (not the one I bought it from) build a new wheel with a reputedly stronger hub and a wider rim more suited to the 2.8 inch tyre I fitted. However, after two hours on it in with its new rear wheel in grippy (damp) conditions at the Upton Canyons site (I think it is called) the new wheel’s hub had several internal gear teeth shear off. It was replaced, then the chain kept jumping off (it had suddenly worn out) and I had that replaced together with the chain-ring and another rear ‘cassette.’ The bike worked well for another couple of hours riding. (In reality just a few minutes’ riding; I spend much time stopped on the bike getting my breath back after each strenuous section.) At the top of a second gear climb on its second day out, the fourth hub seized. 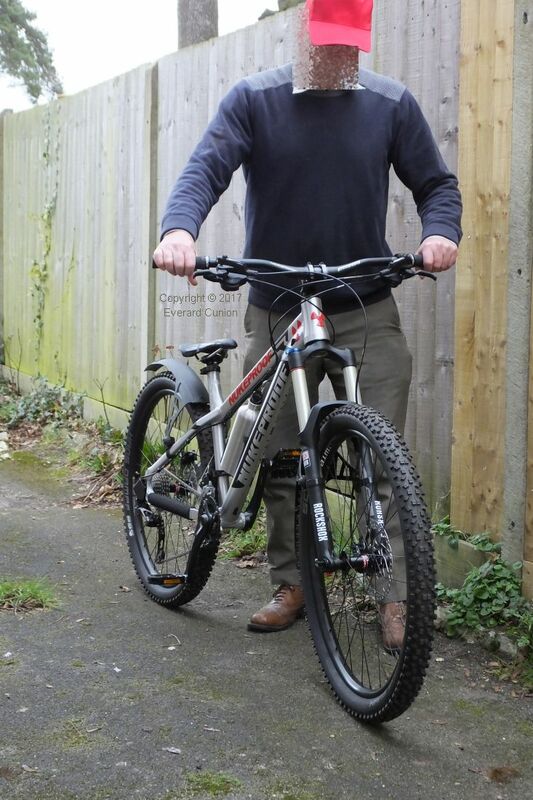 In September and October 2018, the bike was at the shop again for six weeks. They could not understand why the hub had seized, so they sent it back to the factory. There they discovered that the pawl springs had been installed upside-down initially (at the factory). They fitted freehub number five. 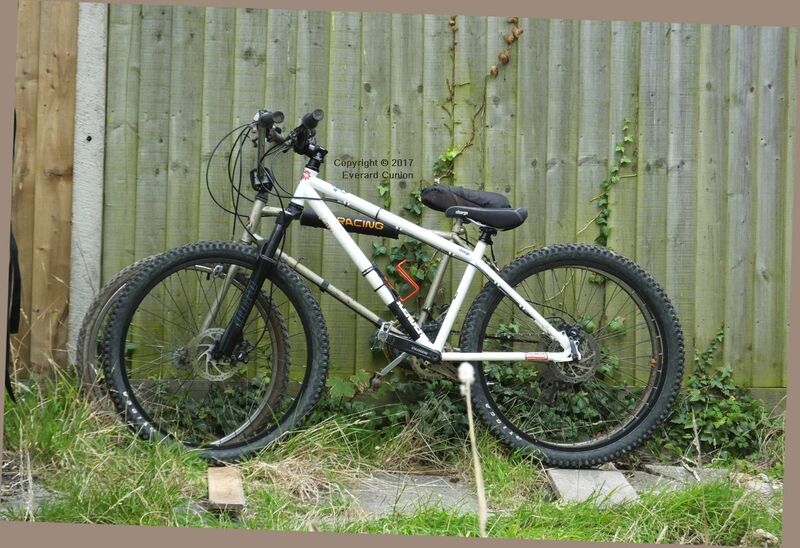 I have had several outings on it as of this writing, including some huge climbs in grippy conditions in first gear, and it has held up so far.